Twins from one egg occur about once in every 250 births around the world. Twins from two eggs occur in 1 out of every 100 births in white women and 1 out of 79 births in black women. In certain areas in Africa, twins occur once in every 20 births! Hispanic women also have a higher incidence of twins. The occurrence of twins in Asian populations is less common—about 1 in every 150 births. No matter how it occurs, being pregnant with two or more babies can affect you in many ways. Your pregnancy will be different, and the type of adjustments you may need to make may be more extensive. These changes and adjustments may be necessary for your health and the health of your babies. Work closely with your doctor and other healthcare professionals to help ensure your pregnancy is healthy and safe. The increase in multiple births among older women has been attributed to higher levels of gonadotropin, the hormone that stimulates the ovaries to develop and to release eggs. As you age, the level of gonadotropin increases, and you’re more likely to produce two eggs during one menstrual cycle. Most twin births in older women are fraternal twins—babies born from two different eggs. Twin fetuses usually result (over 65% of the time) from the fertilization of two separate eggs; each baby has his or her own placenta and amniotic sac. These are called dizygotic (two zygotes) twins or fraternal twins. With fraternal twins, you can have a boy and a girl. About 35% of the time, twins come from a single egg that divides into two similar structures. Each has the potential of developing into a separate individual. These are known as monozygotic (one zygote) twins or identical twins. Either or both processes may be involved when more than two fetuses are formed. What we mean by that is triplets may result from fertilization of one, two or three eggs, or quadruplets may result from fertilization of one, two, three or four eggs. 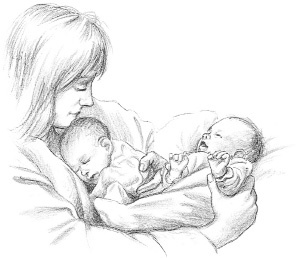 The incidence of twin births can run in families, on the mother’s side. One study showed that if a woman is a twin, her chance of giving birth to twins is about 1 in 58. If a woman is the daughter of a twin, she also has a higher chance of having twins. Another study reported that 1 out of 24 (4%) twins’ mothers was also a twin, but only 1 out of 60 (1.7%, about the national average) of the fathers was a twin. Multiple births are also more common with in-vitro fertilization. This may be due to the frequent use of fertility drugs to increase the chance of pregnancy or the introduction of several fertilized eggs into the uterus in hopes that at least one will implant. Pregnancy with twins as a result of a fertility treatment most often results in fraternal twins. In some cases of higher-number fetuses, a pregnancy can result in fraternal and identical twins, when more than one egg is fertilized (dizygotic twins) and, in addition, one or more of the eggs divides (monozygotic twins). The percentage of male fetuses decreases slightly as the number of fetuses in a pregnancy increases. In other words, as the number of babies a woman carries increases, her chances of having more girls also increases.